We've got 182 games you can play for free, right now. Back in November 2012, we began Indie Speed Run, a game development event in which small teams had just 48 hours to make a game that could win the affections of some of the biggest names in the industry. Starting today, Notch (Minecraft), Ron Gilbert (Monkey Island), Kellee Santiago (Journey), Jason Rohrer (Passage), Vander Caballero (Papo & Yo), Trent Oster (Baldur's Gate: EE) and Dino Patti (Limbo) will each choose one game hosted right here on The Escapist to send to Zero Punctuation's Ben "Yahtzee" Croshaw for his judgment, while our community will pick three! You can access the game page by clicking here, and rate the games you've played between one and five stars. Feel free to use your own rubric to decide what deserves the most stars, but keep in mind each game's required Theme and Element (as listed on each of the game pages) while you play. You may rate each game only once per day, but play them as often as you like. On January 31st, the voting period will end, and find your favorite three games based on their average rating, and the number of votes received. Come back in February to see which one Yahtzee chose to take home $2,500! 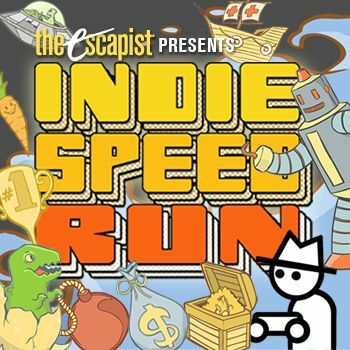 You can find out more info about Indie Speed Run at www.indiespeedrun.com, on Twitter @indiespeedrun, or right here on The Escapist when we've got big news to share! We'll be running more events like this in the future, and don't forget: Escapist Pub Club members get in for just 50% of the entry!